Many folks in and out of our business as well, have different ideas when it comes to Championship Titles. Some view them as just a prop. They have the idea that since the industry is predetermined, or "worked" using the so called "smart" lingo, that the belts are just a thing. I'm climbing back on my proverbial soapbox today, to tell you that the assemblage of leather and metal, are far from being just a thing. The photo above depicts four prominent titles, that have special places in my heart. They have all been worn at one time or another, by a member of The PRINGLE DYNASTY. 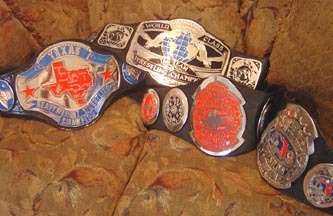 From left to right are The World Class Texas Heavyweight Championship, The World Class Tag Team Championship, The Southern Heavyweight Title, and The Florida Heavyweight Championship. 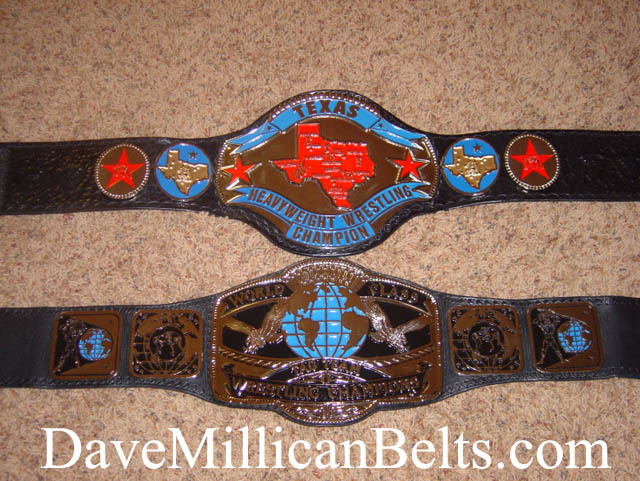 These are the original belts, not replicas. I am proud to say that both World Class belts are a part of my personal collection. How these four belts came together for this photo, is a story unto itself. You see, during the last years of the 1980s, when Texas wrestling underwent a tremendous change, World Class closed it's doors, and USWA replaced it for awhile. 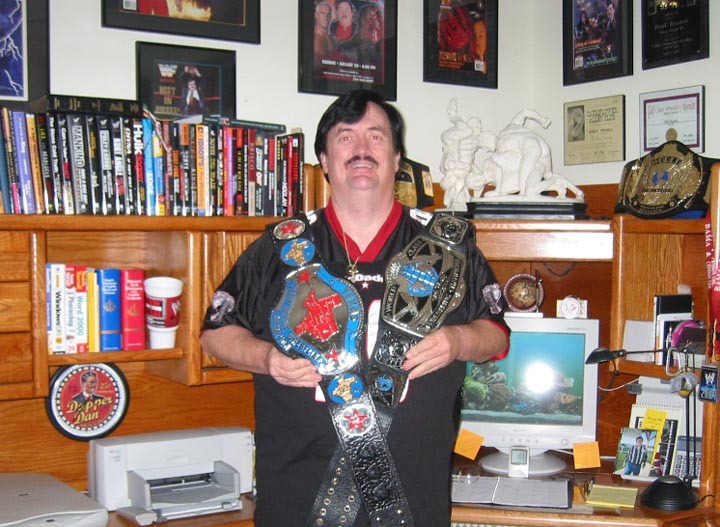 I was working in the office at The Sportatorium at the time, and the two belts ended up in my closet. They stayed there for almost 15-years, until I met Dave Millican several months ago. Dave and the legendary Reggie Parks, are the Kings when it comes to original title belts in our sport. 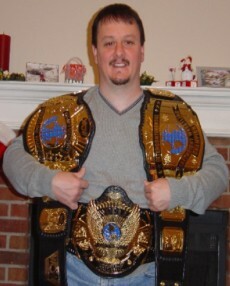 Dave learned that I had the two belts in my possession, and offered to clean them up for me. To make a long story short, I sent them to him. The photo above, shows what they looked like when I put them into his hands. The photo below shows what his talent and respect for our business did for my collection. Needless to say, these pictures are worth a thousand words. They look like they did the first time they were ever worn at The Sportatorium. I can tell you that they are not hiding in my home office anymore. I'm finally out of the closet! That you can see from the photo below. When you pour your blood, sweat and tears into a business such as ours, the trophies that we gather mean so much to us. They represent the thousands of miles spent on the road away from your family. They stand for the many opponents that you have faced in those countless arenas around the world. The belts, simple to some, become a part of you. They are history. If those belts around my shoulders could only talk. Can you imagine what they would have to say? The stories about The Von Erich Family, The Freebirds, Gino Hernandez, Chris Adams, Rick Rude... I could go on and on. If we are on the same page, you understand, and no further words are necessary. If you don't get it, there's not enough words for me to write for you. 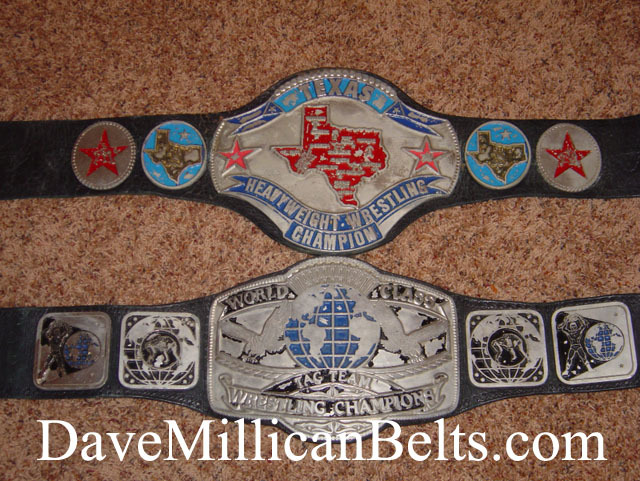 I would like to thank Dave Millican and Reggie Parks for restoring my belts. Dave has such a tremendous respect for our business and it's history, that he refused to take any money from me for his work. He said, that his pay was just being allowed to work on such artifacts.